The life of 'Aa'ishah is proof that a woman can be far more learned than men and that she can be the teacher of scholars and experts. Her life is also proof that a woman can exert influence over men and women and provide them with inspiration and leadership. Her life is also proof that the same woman can be totally feminine and be a source of pleasure, joy and comfort to her husband. 'Aa'ishah became the Prophet's wife in Makkah when she was most likely in the tenth year of her life but her wedding did not take place until the second year after the Hijrah when she was about fourteen or fifteen years old. Before and after her wedding she maintained a natural jollity and innocence and did not seem at all overawed by the thought of being wedded to him who was the Messenger of God whom all his companions, including her own mother and father, treated with such love and reverence as they gave to no one else. "I was playing on a see-saw and my long streaming hair was dishevelled," she said. "They came and took me from my play and made me ready." They dressed her in a wedding-dress made from fine red-striped cloth from Bahrain and then her mother took her to the newly-built house where some women of the Ansaar were waiting outside the door. They greeted her with the words, "For good and for happiness may all be well!" Then, in the presence of the smiling Prophet, a bowl of milk was brought. The Prophet drank from it himself and offered it to 'Aa'ishah. She shyly declined it but when he insisted she did so and then offered the bowl to her sister Asmaa who was sitting beside her. Others also drank of it and that was as much as there was of the simple and solemn occasion of their wedding. There was no wedding feast. "One day, the Prophet came in when I was playing with the dolls and he said: 'O 'Aa'ishah, what game is this?' 'It is Solomon's horses,' I said and he laughed." Sometimes as he came in he would screen himself with his cloak so as not to disturb 'Aa'ishah and her friends. "They are raving, out of their minds, through the heat of the fever." "How is your love for me?" "O Messenger of God, tell me of yourself. If you were between the two slopes of a valley, one of which had not been grazed whereas the other had been grazed, on which would you pasture your flocks?" "On that which had not been grazed," replied the Prophet. "Even so," she said, "and I am not as any other of your wives. Everyone of them had a husband before you, except myself." "It is as if there had never been any other woman in the world except Khadijah." Once, when Aishah complained and asked why he spoke so highly of "an old Quraysh w oman", the Prophet was hurt and said: "She was the wife who believed in me when others rejected me. When people gave me the lie, she affirmed my truthfulness. When I stood forsaken, she spent her wealth to lighten the burden of my sorrow.."
Despite her feelings of jealousy which nonetheless were not of a destructive kind, 'Aa'ishah was really a generous soul and a patient one. She bore with the rest of the Prophet's household poverty and hunger which often lasted for long periods. For days on end no fire would be lit in the sparsely furnished house of the Prophet for cooking or baking bread and they would live merely on dates and water. Poverty did not cause her distress or humiliation; self-sufficiency when it did come did not corrupt her style of life. "Indeed I desire God and His Messenger and the abode of the Hereafter,"
She stuck to her choice both during the lifetime of the Prophet and afterwards. Later when the Muslims were favored with enormous riches, she was given a gift of one hundred thousand dirhams. She was fasting when she received the money and she distributed the entire amount to the poor and the needy even though she had no provisions in her house. Shortly after, a maidservant said to her: "Could you buy meat for a dirham with which to break your fast?" "If I had remembered, I would have done so," she said. The Prophet's affection for 'Aa'ishah remained to the last. During his final illness, it was to 'Aa'ishah's apartment that he went at the suggestion of his wives. For much of the time he lay there on a couch with his head resting on her chest or on her lap. She it was who took a toothstick from her brother, chewed upon it to soften it and gave it to the Prophet. Despite his weakness, he rubbed his teeth with it vigorously. Not long afterwards, he lost consciousness and 'Aa'ishah thought it was the onset of death, but after an hour he opened his eyes. 'Aa'ishah it is who has preserved for us these dying moments of the most honoured of God's creation, His beloved Messenger may He shower His choicest blessings on him. "No Prophet is taken by death until he has been shown his place in Paradise and then offered the choice, to live or die." Then she heard him murmur: "With the supreme communion in Paradise, with those upon whom God has showered His favor, the Prophets, the martyrs and the righteous..." Again she heard him murmur: "O Lord, with the supreme communion," and these were the last words she heard him speak. Gradually his head grew heavier upon her chest, until others in the room began to lament, and 'Aa'ishah laid his head on a pillow and joined them in lamentation. In the floor of 'Aa'ishah's room near the couch where he was lying, a grave was dug in which was buried the Seal of the Prophets amid much bewilderment and great sorrow. 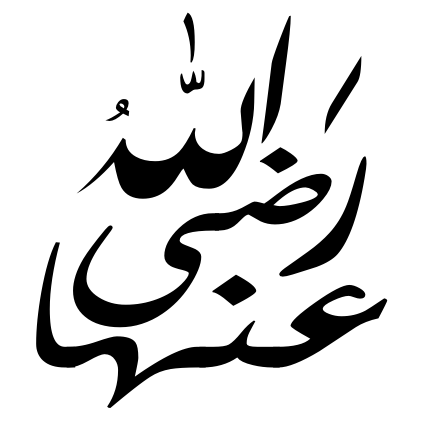 'Aa'ishah lived on almost fifty years after the passing away of the Prophet. She had been his wife for a decade. Much of this time was spent in learning and acquiring knowledge of the two most important sources of God's guidance, the Qur'aan and the Sunnah of His Prophet. 'Aa'ishah was one of three wives (the other two being Hafsah and Umm Salamah) who memorized the Revelation. Like Hafsah, she had her own script of the Qur'aan written after the Prophet had died. So far as the Prophetic Narrations or sayings of the Prophet are concerned, 'Aa'ishah is one of four persons (the others being Abu Hurayrah, 'Abdullah ibn 'Umar, and Anas ibn Malik) who transmitted more than two thousand sayings. Many of these pertain to some of the most intimate aspects of personal behavior which only someone in 'Aa'ishah's position could have learnt. What is most important is that her knowledge of Hadeeth was passed on in written form by at least three persons including her nephew 'Urwah who became one of the greatest scholars among the generation after the Companions. "If we, the companions of the Messenger of God, had any difficulty on a matter, we asked 'Aa'ishah about it." Her nephew Urwah asserts that she was proficient not only in Islamic Jursiprudence but also in medicine (tibb) and poetry. Many of the senior companions of the Prophet came to her to ask for advice concerning questions of inheritance which required a highly skilled mathematical mind. Scholars regard her as one of the earliest scholars of Islamic Jurisprudence of Islaam along with persons like 'Umar ibn al-Khattab, 'Ali and 'Abdullah ibn 'Abbas. The Prophet referring to her extensive knowledge of Islaam is reported to have said (the narration is weak, but the meaning is sound): "Learn a portion of your religion (deen) from this red colored lady." "Humayra" meaning "Red-coloured" was an epithet given to 'Aa'ishah by the Prophet. "I have heard speeches of Abu Bakr and 'Umar, 'Uthman and 'Ali and the Khulafaa' up to this day, but I have not heard speech more persuasive and more beautiful from the mouth of any person than from the mouth of 'Aa'ishah." Some of her students were outstanding. We have already mentioned her nephew 'Urwah as a distinguished reporter of Hadeeth (Prophetic Narrations). Among her women pupils is the name of 'Amrah bint 'Abdur-Rahman. She is regarded by scholars as one of the trustworthy narrators of hadith and is said to have acted as 'Aa'ishah's secretary receiving and replying to letters addressed to her. The example of 'Aa'ishah in promoting education and in particular the education of Muslim women in the laws and teachings of Islaam is one which needs to be followed. After Khadijah al-Kubra (the Great) and Fatimah az-Zahraa' (the Resplendent), 'Aa'ishah as-Siddiqah (the one who affirms the Truth) is regarded as the best woman in Islaam. Because of the strength of her personality, she was a leader in every field in knowledge, in society, in politics and in war. She often regretted her involvement in war but lived long enough to regain position as the most respected woman of her time.